Slate is probably the type of stone tile you'll encounter most often. It's a metamorphic rock that splits into thin sheets easily. Once it cleaves into sheets like that, it's easy to turn it into. If your designer or architect is talking about slate, you've got a real professional who's on your side in the design area who knows their materials well. Slate can be adapted to any purpose in design, and because of its versatility in color, you can work with any number of design concepts for your home. 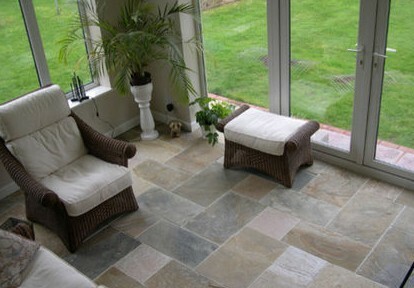 You can have a different slate design in every room just as you like. It is regarded as a very high status designer in building material, but it's perfect for the family home. This is a very tolerant type of that can take a beating and look no worse for it. If you've got young kids or energetic older kids, slate stone will soak up the punishment easily. If you've ever tried to deal with flooring problems in a high usage are, you'll know exactly what that means. The beauty of slate is also very much in its practical applications, as well as the elegant appearance. There's nothing it can't do, and it does everything well.